You want to ensure that you have the last night of your bachelorhood the best one before you get hitched. 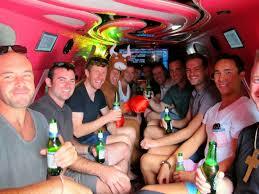 So wouldn’t it be great to start your bachelor party with a stylish luxury limousine? Our stretch limo can hold up 12 to 16 passengers in the cabin. Limos are great for a bucks night party as they have the party feel and create immediate party ambience – drinks, music, interior disco lights so you can have all the fun! All our fleets are well maintained and they come with TV screen, DVD player, USB ports and more. This guarantees that your friends will also have a great time riding the best luxury limo in Melbourne with style and class on your bucks night. We can drive you anywhere in Melbourne for your bucks night. We will tailor the package based on your itinerary and provide you with what you need for the night. There are a lot of well-known Buck’s party venues in Melbourne. We will ensure that you have a grand arrival to your Buck’s night party venue and party like a Hollywood celebrity. > Our Fleet – Image Limousines offer you a wide range of fleet that will take you to your destination in elegance and style. We strive to make special events and special occasions like Bucks night you will remember for a lifetime. > Stress-Free – We ensure that your bucks are a stress-free one, we will get all the details from you at the first point of contact and arrange them accordingly, without having to contact you on the of the party, so you will have plenty of time to get groomed and enjoy the night with your buddies. > We follow your Itinerary – Some people plan various activities for their bucks night e.g. eating out at a restaurant, followed by a party then after party in a private club. You can hire our services for as long as you need, even long into the night to keep the party going. > Fits 12 to 16 people – Our limos can fit up to 12- 16 people comfortably depending on the limo, so there is room for all your close buddies and friends. > Qualified Drivers – Our aim is to provide clients with a pleasing experience with us through our professional qualified and courteous drivers trained to do their task excellently. We will enhance your driving experience by giving you world class service one that will match even Hollywood’s red carpet events. Call us on (03) 9484 3999, to hire a Bucks night Limo in Melbourne.